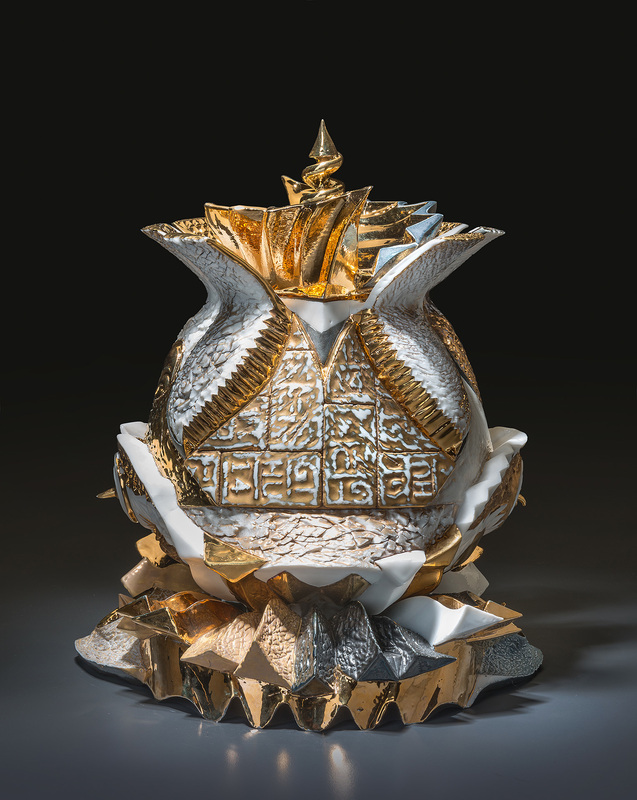 Only one person could have made the 75 ceramic vessels spanning five decades now on view at the Belger Arts Center. 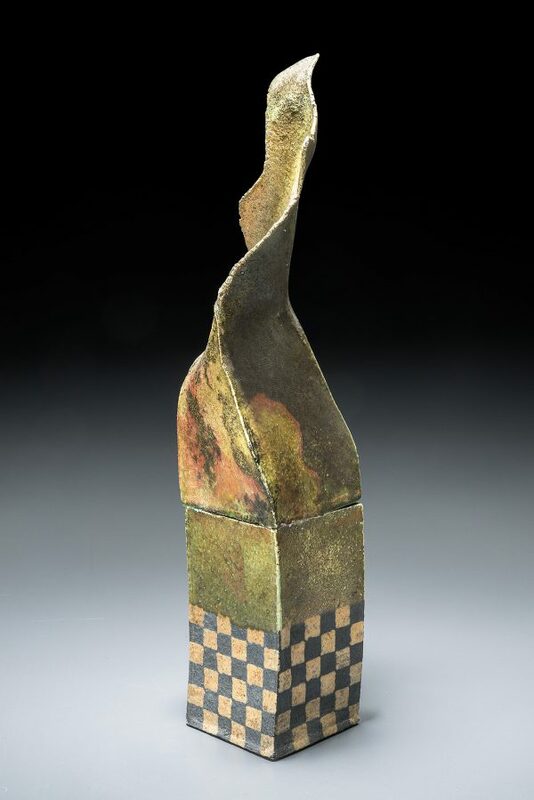 George Timock’s handling and sculpting of clay is totally distinctive, whether in his early raku work or his more recent porcelain vessels. 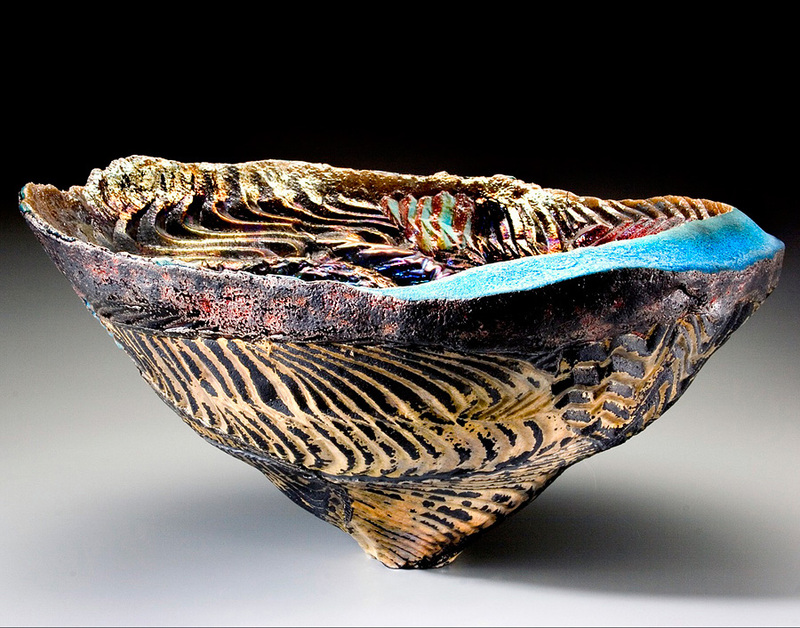 If his double-walled raku bowls, made from approximately 1966 – 2006, are flagrantly open and invite you to dive into them, his porcelain pieces, which he began after a trip to Hungary in 2006, have become increasingly complex and self-contained over time. 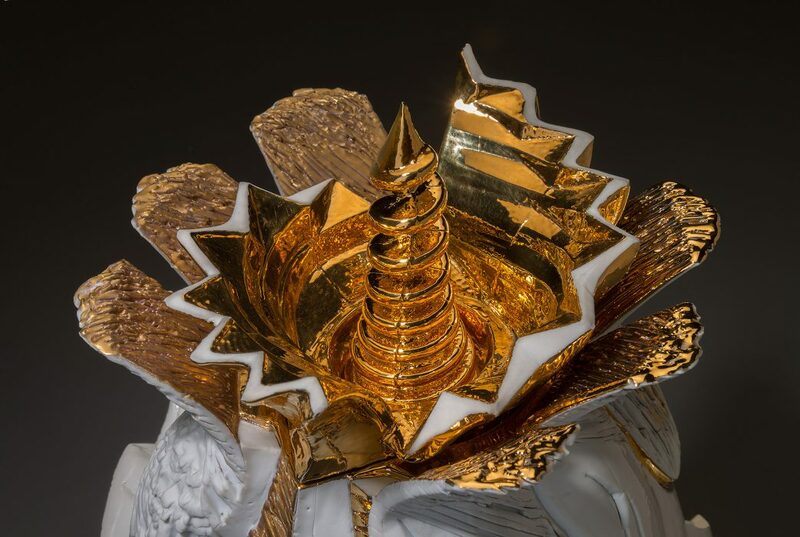 With their layers of gilded paint and carefully sculpted, multi-faceted exteriors, they resemble precious treasure pots, worthy of a royal habitat. 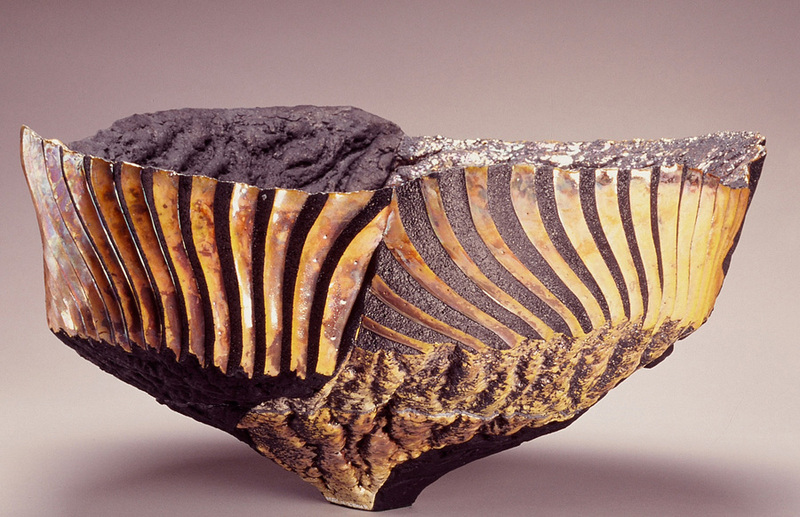 Timock earned both his bachelor of fine arts and master of fine arts from Cranbrook Academy, where he studied with esteemed ceramist Richard DeVore. From the start, it’s clear that Timock has followed his own muse, which is somewhere between Poseidon rising from the waters, Vesuvius exploding and Marie Antoinette at her rococo best. Throw in a dose of the Catholic Church as well. His early work, which encompassed painting and sculpture, has also influenced his unique approach to both coloring and shaping clay. Timock did not start out to be an artist. He grew up in Flint, Michigan, and graduated from high school in 1963. He went to Flint Junior College and started out as a botany major. Things quickly changed. “I had to cross the art center to get to class and I saw an old school friend throwing clay on a wheel,” he said in a recent interview. “I was fascinated, and asked her: what is all this? Then I saw a guy smashing all his pots. It was Richard DeVore.” DeVore (1933 – 2006), who taught at Flint, and was one of the greatest ceramic artists in the country, ended up playing a significant part in Timock’s artistic development. Timock decided to change his major to art. The school secretary told him he needed a portfolio to get accepted. He responded: “What’s a portfolio? Not long after, DeVore left Flint to take over as head of ceramics at Cranbrook Academy near Detroit, one of the top-ranked graduate schools in architecture, design and fine art. Coincidentally, for a short period of time Cranbrook accepted five undergraduate art students into their graduate level classes, and Timock was accepted to the Academy while also attending Wayne State. 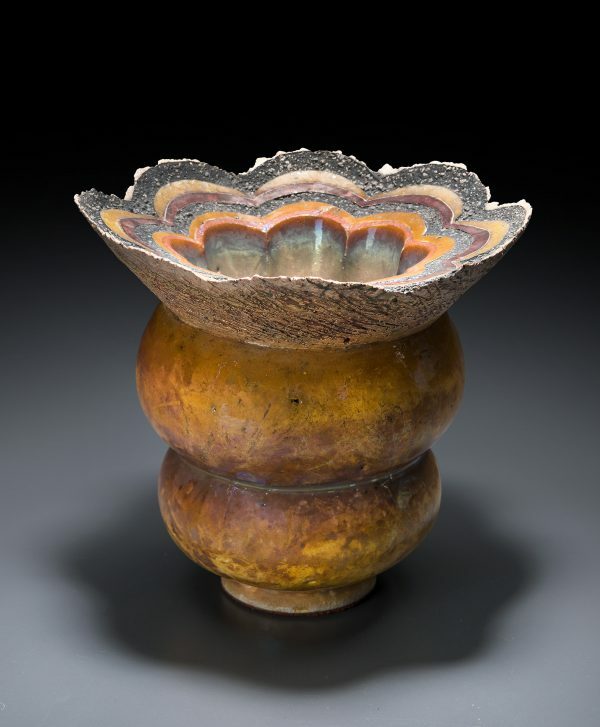 After Cranbrook, Timock began teaching at the Kansas City Art Institute in 1973, working almost exclusively making raku ware. 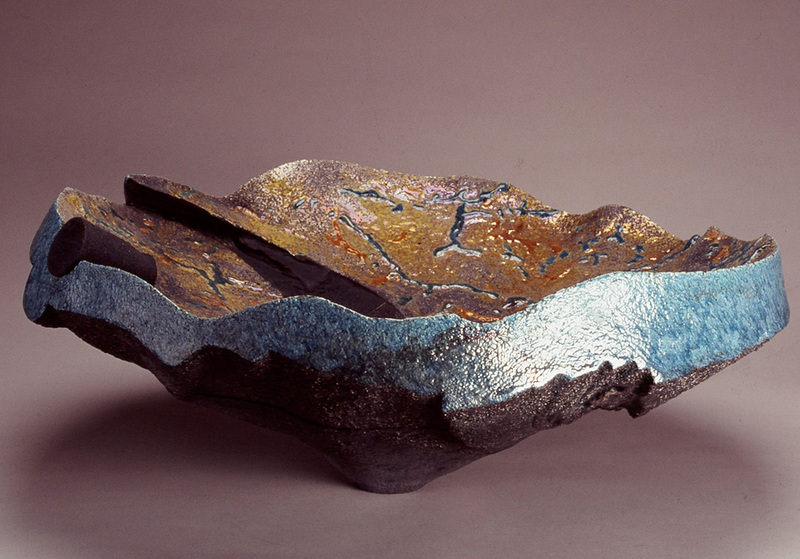 Initially his raku platters were stylistically ordered and symmetrical. That changed, especially after a month-long trip to Hawaii in the early 1990s, during which time he climbed down into the guts of the Kilauea volcano. The lava fields motivated Timock to make latex molds of the volcanic rock itself, which turned out to be a perfect fit for the gritty surfaces of his increasingly expansive raku vessels. That included shooting foam into his massive, double-walled forms and sand-blasting and glazing some works as many as 46 times. As earthy as the outside surfaces of Timock’s vessels were, inside were glossy topical “swirls” resembling Möbius strips in muted rainbow colors. “’I’ve always liked op-art artists like Bridget Riley and Vasarely, and see some of their influence in my work,” Timock says. That includes the vessels Timock began making after a sojourn in Hungary more than 10 years ago, which resulted in an about-face with his oeuvre. After receiving an LIAEP (Lighton International Artists Exchange Program) grant, Timock traveled to the International Ceramics Studio in Kecskemet, known for having the whitest porcelain clay in the world. While there, Timock also explored the eastern European architecture in the area. From 2006 until his retirement in 2013, Timock taught KCAI students every summer at the International Ceramics Studio (a picture of him is still on the Studio’s website). 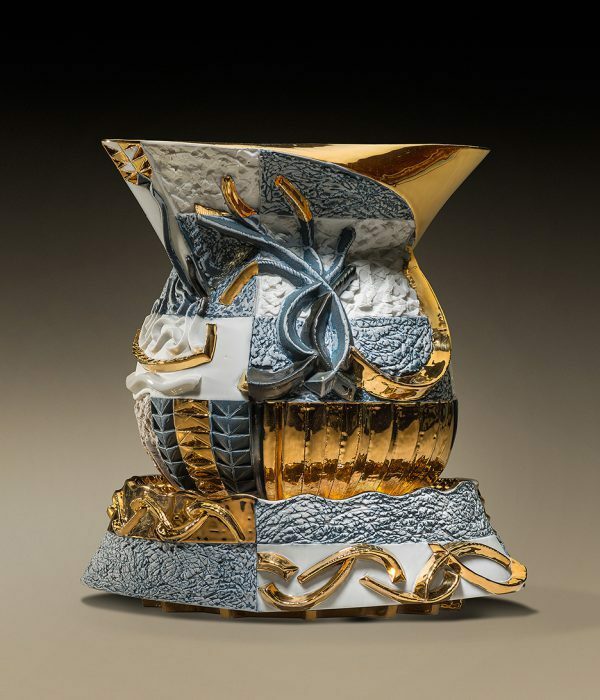 In the meantime, he began working exclusively in porcelain, creating containers with labyrinthine exteriors as refined, even precious, as his earlier works were volcanic. After retiring three years ago, Timock moved to Santa Fe where he built a studio. He began making molds using a 3-D printing process, which requires him to painstakingly piece together the multiple parts that make up each vessel. Timock uses two coats of luster paint for each work that is painted. Some of the pieces have such elaborate, peaked and uneven bottom surfaces that he hired artist Kim Lindaberry to design mirrored pedestals for them, so the ulterior side can be viewed. “I can only make two of these a year,” Timock says. Timock is in touch with the art of many indigenous artists around the world, and understands that a successful life is one that integrates the visible world with the invisible one of the spirit. That could explain why each of his vessels, no matter the period, pulls the viewer deep inside its impenetrable interior, whether it can be seen or not.